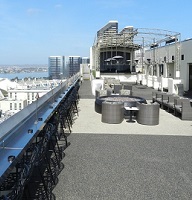 Rubber surfaces, non-slip floors, playgrounds, and artificial grass for cool rooftops, decks, and patios. 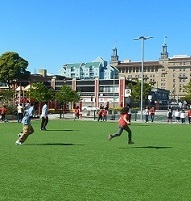 Playing fields, park trails, playgrounds, and more for cities, parks and recreation departments, and public works. 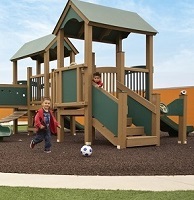 Playground surfaces, playing fields, and safe, non-slip rubber running tracks for schools, day care centers, and churches. 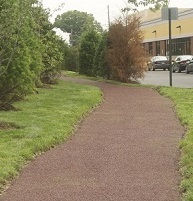 Sustainable rubber sidewalks, pathways, playgrounds, and artificial grass for landscaping in new communities, shopping centers, and other urban developments. 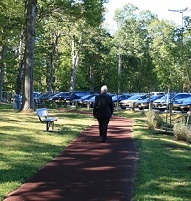 Safe, non-slip rubber trails, walkways, balconies, and patios for senior centers and assisted living communities. Walking and jogging trails, rubber sidewalks, and recreational areas for health and wellness at corporate campuse.